Will JPMorgan Chase Raise Its Dividend in 2019? Banks continue to thrive, and investors want more of their fair share. 2018 was a disappointing year for banking giant JPMorgan Chase (NYSE:JPM). Shares of the New York-based company sagged by about 9%, and despite seeing solid fundamentals throughout much of the year that resulted in solid growth in deposits, loans, and credit card revenue, shareholders became nervous late in 2018 that the recent rise in interest rates would come to an end, bringing with it potential contraction in the interest income growth that the banking giant has seen over time. Dividend investors have long looked to JPMorgan Chase for income, and the bank has been diligent in paving the way forward. Shareholders got a huge dividend increase in 2018 and they'd enjoy seeing even larger quarterly payments in 2019 and beyond. Let's look more closely to see whether JPMorgan Chase investors can bank on higher dividends in the coming year. JPMorgan Chase has seen its dividend fully recover from its challenges during the financial crisis. The bank has historically been able to offer dividend yields that stay within a range of around 2.5% to 4%, but in 2009, it slashed its dividend to the bone, making just a $0.05 per-share quarterly payout in order to comply with the requirements of government bailout guidelines. Even at the time, JPMorgan didn't really want to make that move. It worked to reverse the dividend cut as quickly as possible, and it only took a couple of years before it got permission to quintuple its dividend. By 2014, the bank had restored its full dividend from before the financial crisis. But as you can see below, that wasn't enough to satisfy JPMorgan, which went quite a bit further. Shareholders had something to celebrate in 2018, as JPMorgan gave investors a 43% boost to their quarterly payouts effective in October. On top of strong business conditions, JPMorgan also benefited from lower corporate tax rates following tax reform in late 2017, and that was a factor in prompting the outsized dividend increase. 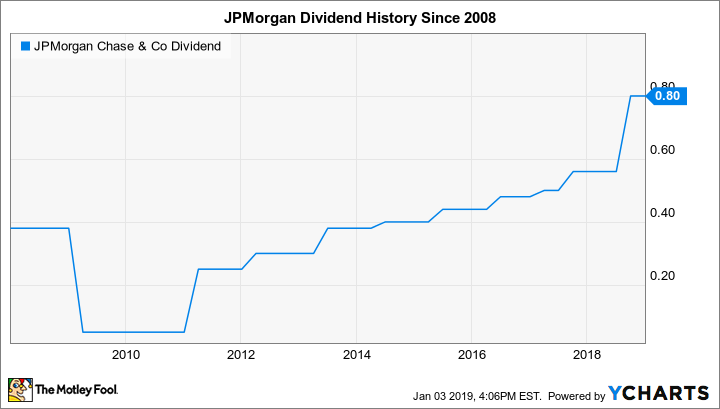 Can JPMorgan's dividend keep climbing in 2019? A lot of investors have focused on the inverting yield curve as a warning sign for JPMorgan and its peers. Yet at least so far, the implied recessionary threat hasn't really materialized, as unemployment remains at levels not seen in decades and overall economic growth has remained steady. That's a favorable environment for JPMorgan, which benefits when consumers have the confidence to spend and the wage growth to invest in bank savings and investment products. Another thing to keep in mind is that JPMorgan has been making big buybacks of its stock, as well. A combination of both methods for returning capital to shareholders seems like the preferred method for regulators at the Federal Reserve and elsewhere, giving JPMorgan the best chance to have its capital plans approved annually. But another impact of buybacks is that the resulting drop in share counts means that JPMorgan can boost per-share payments without necessarily committing a larger amount of absolute cash to dividends. With its share count down more than 300 million shares in less than three years, JPMorgan has more flexibility to consider future increases. It's unlikely that JPMorgan Chase will deliver another 40%-plus boost in 2019, but it's healthy enough to pay a substantial amount in additional dividends. Returning to its past 10% to 15% dividend growth rate would make a boost to around $0.88 to $0.92 per share within the realm of possibility, and that would be enough to give shareholders even more confidence in JPMorgan's long-term prospects.